You never forget your first time. The insecurity as you take the plunge, the fire in your belly, the lasting satisfaction afterwards. I am of course referring to the first time you tried cask strength whisky. Most whiskies sold commercially have been diluted down to an ABV deemed acceptable to public consumers of alcohol, usually 40-43%. This is undoubtedly a good thing, or us whisky drinkers would be permanently sloshed and unable to string multiple sentences together, let along write eloquently worded whisky blogs. However, there’s just something a bit special about trying a whisky as it can be found in the barrel. These whiskies are called ‘cask strength’ and usually sit somewhere in the mid to high 50s percentage alcohol wise, although can rise as high as the low 70s. Trust me, when you are drinking one of these, you know about it. Glenfarclas are a wonderful family-owned Speyside distillery who use mainly Sherry barrels to mature their spirit in. They release a range of (impressively affordable) age statements as well as the 105, their cask strength, which is bottled at a nice round 60%. And it’s an absolute monster. Although a monster in the vein of King Kong, in that it can be brought under control (at least temporarily, before storming off to climb the Empire State Building). On the nose the sherry influence is prominent, notes of grapes, raisins and other dried fruits coming through along with several sweeter aromas of treacle and iced tea. It’s pleasant, although if your nose ventures too far into your Glencairn, you will receive an eye-watering whiff of the alcohol to come. The palate is where you first notice the power of the whisky. Hot, spicy, tangy and sharp, it’s far from the smoothest drop you are likely to try. But once past the shock there are plenty of pleasing flavours to be found, such as oak, marmalade and stewed fruits, such as apricots and quinces. The finish of a cask strength whisky is often the highlight and the 105 is no exception. It is dry, long lasting and ever so warming. Not just in your mouth, but after you have swallowed it, within your entire chest. This whisky is a viable alternative to paying heating bills. Many advocate the need to add water to cask strength whiskies. In a lot of ways they are right. With only a few drops of water, the Glenfarclas 105 becomes immediately smoother and presents new floral aromas and flavours of honey and cloves. But it also loses the fire contained within its 60% self. That wonderful warming sensation is gone, along with some of the magic of the drop. 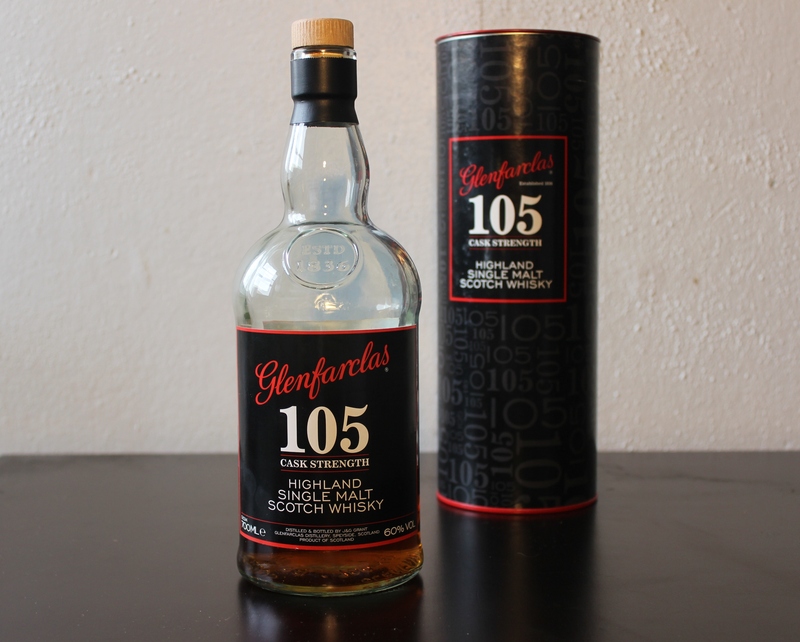 The Glenfarclas 105 is a fantastic dram, and a great example of a cask strength whisky. It is certainly not for the faint hearted, but is well worth it if you can make it back for a second sip. Ha ha, excellent! I can understand that, if any whiskies are safe to sample early in the morning, then this is certainly not it! I hope you enjoy it though, when you get the opportunity to do so! Ah, the Richard Stewart cask strength love affair origins story! I look forward to hearing more some day. In the mean time, I’ll enjoy me some more of this great drop. I have a bottle of this and the A’bunadh and am looking forward to a head to head tasting in the near future. Have you had both? If so do you have a preference for one over the other? The clash of the (sherried) titans! Yeah, I’ve had a bit of the A’bunadh and have decided I prefer the 105. However, the Abelour is always a single barrel release, so will vary from bottle to bottle. Maybe I’m yet to have the best ones on offer!